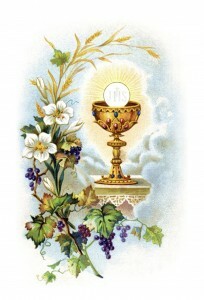 Last Sunday, 24 children in our school celebrated their first Holy communion at Arundel Cathedral, Slindon church, and at Our Lady Star of the Sea. During our Thursday celebration assembly, all children received a special card from the school congratulating them. The children explained how they really enjoyed receiving the bread and the wine and they loved celebrating with their families afterwards. 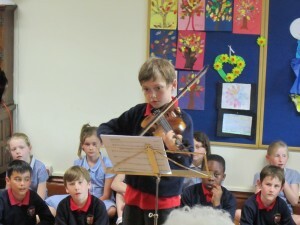 On Tuesday 23rd, the children of St Philip’s gave a fantastic performance in our school’s annual ‘Music in May’ concert. 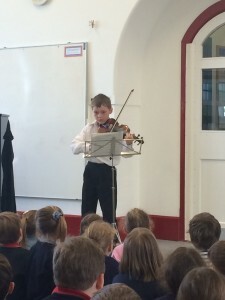 They had two performances, one in the evening to parents and again to the whole school the following day. 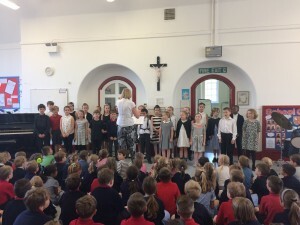 Organised by Miss Robinson, our music teacher, our choir performed a range of songs which showed how well the children are able to sing in harmony, a round and solo. 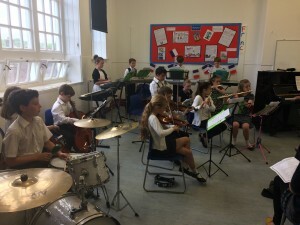 The orchestra performed several different pieces and sounded fantastic. 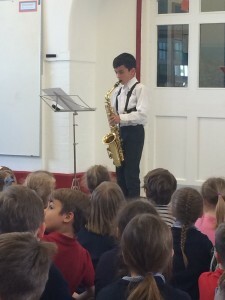 Lots of children performed solo pieces on their instruments including cello, flute, clarinet, saxophone, piano, singing and drums. 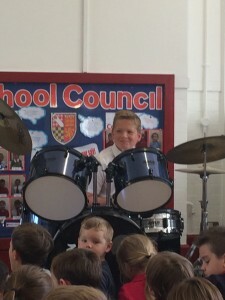 A huge thank you to Miss Robinson for all of her hard work and dedication that goes into preparing for such an event, to the peripatetic music teachers that teach our children and to the parents who support the children so much in their practice and tuition. 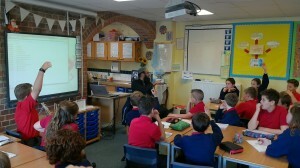 Today we were very lucky to have Imam Idris from Worthing Mosque come to visit St Philip’s. He spent time in all year groups and spoke about Muslim Worship, Holy Books, Beliefs and Festivals and Belonging and Values. 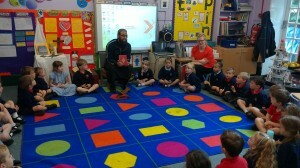 The children were able to ask questions and look at prayer mats and The Quran. Each class will then spend the rest of the week learning about Islam with Year 5 making Eid Fruit cakes, and Year 2 designing their own prayer mats. 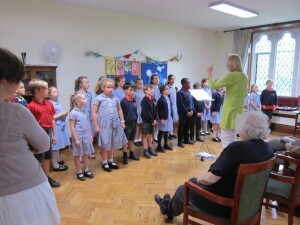 As part of alzheimer’s week, our school choir were invited to go and sing at St Wilfrid’s Priory. The residents really enjoyed our visit and Rosie Beller, the activities organiser said that our children were the best behaved that they have and the residents commented on their manners! 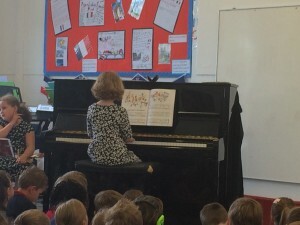 Many thanks to Miss Robinson for rehearsing with the children and Mrs Burgess for going with the children. 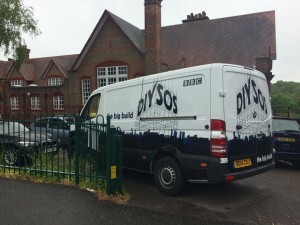 DIY SOS have been transforming a house locally for Mandy Worne. 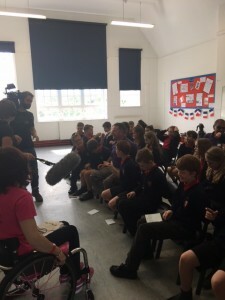 Her four children have all attended St Philip’s School over the last decade and so Mandy chose our school to give her inspirational presentation which was filmed as part of the DIY SOS programme which will be televised on BBC 1 later in the year. The aim of her presentation was to talk to the children about never giving up, believing in yourself and seeing every challenge as a positive. Billy and Mark from the programme also took part in the workshop. This week Year 6 have been taking their end of Key Stage 2 tests. They have worked very hard towards these and each child has shown such perseverance and maturity towards them. 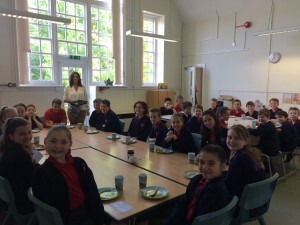 Each morning, before school, the class have met in the Community Room for a special SATs Breakfast where they have been served croissants, fruit and juice. 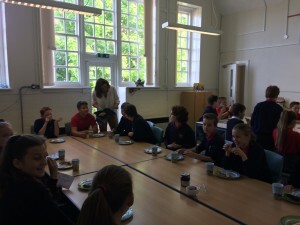 The children have really enjoyed the opportunity to get together in the morning and share breakfast. 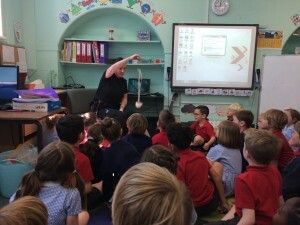 On Wednesday, PC Bishop visited Year 1 to talk to them about road safety. She taught them all about the different types of road crossings and how to use them safely. 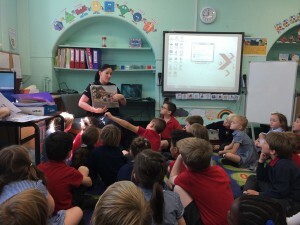 She also spoke to the children about the importance of wearing a helmet when riding a bike. She did an experiment with the children where she used an egg and put it safely inside a helmet and dropped it on the floor – the egg stayed in one piece, she then showed the children what happened to the egg when it was not wearing a helmet. The children loved their visit from PC Bishop and they all got a special sticker for listening so well. 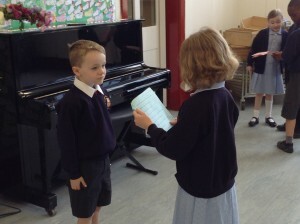 Last term, Year 3 wrote their own play scripts about a Stone Age Boy as part of their Literacy lessons. Last week, Bill Brennan, a local Theater Director, came in and helped the children direct their own plays using the scripts that they had written. He also talked to them about the role of a Theater Director. 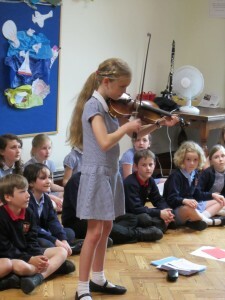 The children really enjoyed the workshop.